Over 70 years since its founding and Gerber continues to grow. Still grounded in the same principles that first guided Joseph R. Gerber’s “enterprise,” Gerber is a company dedicated to making knives and tools that combine high quality materials and innovative designs that will stand up to a lifetime of use. Gerber is, however, no longer just a knife company. 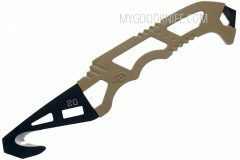 Multi-tools, axes, handsaws, machetes, headlamps, flashlights, survival kits, digging implements – these are the newest directions that Gerber explores with the same standards of quality and design that inform their revered knife making.